Mr. Hoffman is a founder of Kitware and currently serves as Vice President and Chief Technical Officer. He is the original author and lead architect of CMake , an open-source, cross-platform build and configuration tool that is used by hundreds of projects around the world and the co-author of the accompanying text, Mastering CMake. Using his 20+ years of experience with large software systems development, Mr. Hoffman is also a major technical contributor to Kitware’s Visualization Toolkit, Insight Toolkit and ParaView projects. As CTO, Mr. Hoffman’s emphasis is on software development methodologies and establishing best practices across the breadth of Kitware’s development efforts. As one of the visionaries leading the quality software process efforts at Kitware, Bill has been instrumental in adopting agile programming practices fueling Kitware’s software development. He is a frequent speaker on these subjects and has appeared at the O’Reilly Open Source Conference and as an invited speaker at the Google tech talk series. Mr. Hoffman received a B.S. in Computer Science from the University of Central Florida and an M.S. in Computer Science from Rensselear Polytechnic Institute (RPI). 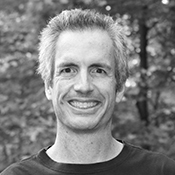 Prior to the formation of Kitware, he spent nine years at at GE’s Research Center working in the Computer Vision Group. He has planned and taught several graduate level courses at RPI as well as a course in object oriented programming at New York University. In three short years Bill has gone from a sedentary computer professional to a successful long distance runner. He has completed 5 marathons and one ultra-marathon. He has done this barefoot or in very minimal shoes. After reading Christopher McDougall’s best seller ?Born to Run? (BTR) in the fall of 2010, I was inspired to start barefoot/minimalist running. Using myself as a test subject, I put McDougall’s hypothesis to test. In his book he presents research suggesting that human?s evolutionary niche is long distance running. We are certainly not the fastest or strongest, but we can run forever. Persistence hunting which is still practiced by several indigenous peoples of the earth not only provided food, but shaped who we are and how we think. In 2010, I was 43, 40 pounds overweight and starting to have the usual aches and pains that come with “age”. I had never been a runner since I was “diagnosed” at the age of 15 with “flat feet” and told by a doctor that running was not for me. After finishing BTR, I purchased a pair of Vibram Five Finger shoes and went for a run. To my surprise I made it a mile without any knee pain. Eleven months later, I finished my first marathon. I have now completed five full marathons including the 2013 Boston Marathon which I qualified for on my third marathon. This summer I finished my first ultra-marathon, a 54K rugged wilderness trail run in the Adirondack Mountains. I now weigh the same as I did in my senior year of high school and I don?t remember ever feeling healthier. I have always enjoyed reading real life adventure books like Into Thin Air. Into Thin Air is a book about an expedition to climb Mt. Everest. Although the adventure ends badly for some, I could not help but be attracted to the idea of climbing onto the top of the world myself someday. However, the idea of taking on an adventure like that would face over time after reading the book. In September of 2010, I found an adventure book that started at my door step, and not only that it claimed that any able bodied human being was qualified and specifically adapted to excel at this adventure. Although I am an example of one my story is an amazing adventure from a sedentary computer programmer to an ultra-marathon runner in less than three years. Each day I become more convinced that we really have evolved to run. I will share my ongoing adventure.